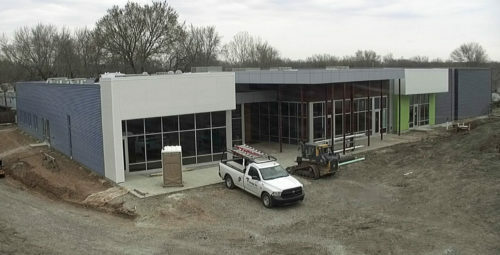 We are nearing the finish line on the interior with finishes well underway. The flooring treatments are everything from a great mix of epoxy resin floors for the animal inhabited spaces to patterned hard tile surfaces with fantastic artistic layout design that make the spaces really stand out. Wall colors just add to both the fun and the function of this wonderful new facility. This mix of different materials is carried on to the exterior where several different products are used to make up the façade. There are large window areas with special glass that cuts down on the glare and reduces the heat gain from outside to inside but allows clear vision both in and out. Nichiha panels in a woodgrain pattern are utilized as well as metal wall panels and metal soffit panels. There can’t be enough said to describe the sophisticated mechanical, electrical and plumbing system designs that have been incorporated to make this facility stand out. Some of the newest design and technologies are installed and will be in use very soon. Marty Criqui, the job site superintendent, has done a wonderful job of managing all the moving parts on this one. Great job and many thanks go out to subcontractors, suppliers, design team and the ownership team.